Most people think of caterpillars as harmless, fuzzy little creatures that will soon morph into beautiful butterflies. 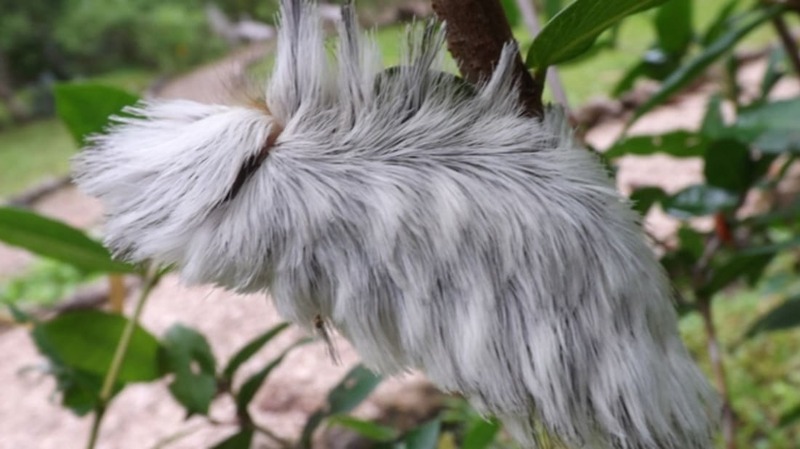 The puss caterpillar (scientific name: Megalopyge opercularis) looks especially furry and soft—like a house cat or a cotton ball—because of its long, fluffy hair. But it’s actually the most dangerous caterpillar in North America. These insects (also called asp caterpillars, wooly asps, or southern flannel moths) grow up to 1.5 inches in length, and their hair can be yellow, orange, red, gray, or light brown. Most puss caterpillars are found in the southeast U.S.—particularly in Florida, Louisiana, and Texas—as well as parts of Mexico and Central America. They live in gardens and parks, feeding on shrubs and trees (mainly shade trees like oak, elm, pecan, and sycamore). The danger from puss caterpillars comes from what’s hiding underneath their fur. Poisonous spines under their long hair contain venom that will wreak havoc on your system if you’re unlucky enough to come into contact with them. Touching one of these caterpillars causes their sharp spines to break off, releasing a dose of venom directly into your skin. People who only have brief, fleeting contact with the caterpillar feel pain, itching, and irritation on the area of skin that touched the insect. But most victims of the puss caterpillar have a much more extreme experience: they immediately feel intense, radiating pain that shoots outward from the contact site. After this severe pain begins, they endure a smorgasbord of terrible potential scenarios: burning, swelling, nausea, vomiting, headache, fever, rashes and blisters, shock, and/or difficulty breathing. Victims of the puss caterpillar have described the pain as radiating through their skin all the way to their bones. Some victims have compared the pain to breaking an arm, while others have claimed it is worse than how it feels to pass kidney stones. While the physical symptoms are bad, the emotional distress can be just as frightening. Most people stung by the puss caterpillar are confused and surprised that caterpillars can be poisonous, and other victims experience panic attacks due to the severity of the pain. Someone who is stung on their finger may feel the pain shoot up their arm to their chest and may mistake this chest pain and armpit swelling for a heart attack. The good news is that if you've been stung by a puss caterpillar, the pain should substantially decrease after an hour. Be sure to remove the spines from your skin as soon as possible, take antihistamines, and apply an ice pack. And although many doctors don’t know about the puss caterpillar and the damage it can inflict, you need to go to a doctor or emergency room, stat! If the caterpillar injected you with a larger amount of venom, your symptoms could last up to a week, and doctors often prescribe narcotic pain relievers to help victims who experience intense pain. So, if you see a fuzzy, cute orange blob crawling around—especially one that looks like a tiny toupee—don’t pick it up, and certainly don’t pet it! It just might be a puss caterpillar.